It has taken decades, and the efforts and enthusiasm of many individuals, to make Tate what it is today. 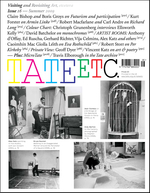 In a continuation of this, our magazine TATE ETC. carries the name – with an additional 'ETC.'. Inspired by the gallery but independent of it, TATE ETC. explores the visual arts scene on an international scale. Tate’s collections, events and projects are the starting point to project the themes and contexts of art far beyond the boundaries of the four galleries. From essays to interviews, from ancient Tate archives to cutting edge studio work, TATE ETC. follows the work creating the most interesting debate, and explores its context, history and meaning. Within these features, we blend the historic, the modern and the contemporary to show that art does not exist in a vacuum, but is rooted in many traditions. With Henry Tate's legacy as a springboard, TATE ETC. has gone on to become the largest art magazine in Europe.